SAO PAULO, March 12 (Reuters) - Brazilian Agriculture Minister Tereza Cristina Dias said on Tuesday that she will discuss U.S.-Brazil trade in meat, sugar and ethanol in talks next week between officials of the two countries. Dias, who will travel with President Jair Bolsonaro to the United States, said one of her priorities is to reopen the U.S. market for Brazil’s fresh beef exports, which were suspended almost two years ago over safety concerns. “The expectation is good. 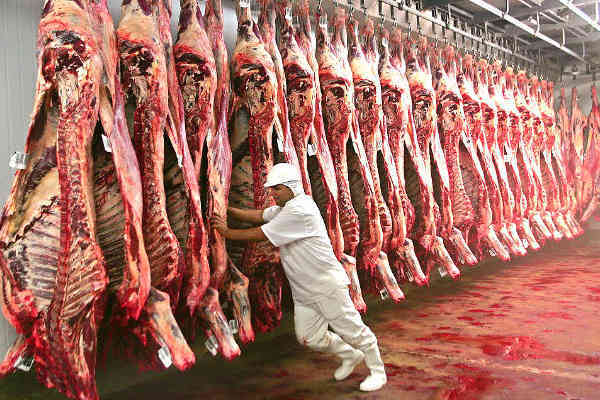 We are preparing documentation and will see if we can reopen this market ... so that all of Brazil’s meat-packers can resume exports to the U.S.,” Dias told reporters at a food industry event in São Paulo. The minister, whose meeting schedule has not been disclosed, declined to say what Brazil was prepared to give in return for a reopening the beef market. Dias said she hoped U.S. officials would show “good will” after Brazil had met every demand and request for information from the Americans regarding its fresh beef exports. The U.S. halted imports of fresh Brazilian beef in June 2017 after a high percentage of shipments failed to pass safety checks. Brazil, the world’s largest beef exporter with about 1.6 million tonnes sold in 2018, has been trying ever since to resume fresh beef sales to the United States. Aside from talks on fresh beef, the minister said she would like to discuss wider access to the U.S. market for Brazilian sugar, and Brazil’s own restrictions to U.S. ethanol imports. Washington has not yet confirmed whether it will agree to discuss both themes, Dias said. Brazil is allowed to export between 150,000 tonnes and 170,000 tonnes of sugar to the United States per year, paying a $14 duty per tonne. Quantities above that limit are taxed at more than $300 per tonne, making sugar sales there nearly impossible, according to Brazilian sugarcane industry group Unica. Brazil enforces a tariff-free quota of 600 million liters of ethanol per year, limited to 150 million liters per quarter. Volumes above that are taxed by 20 percent.